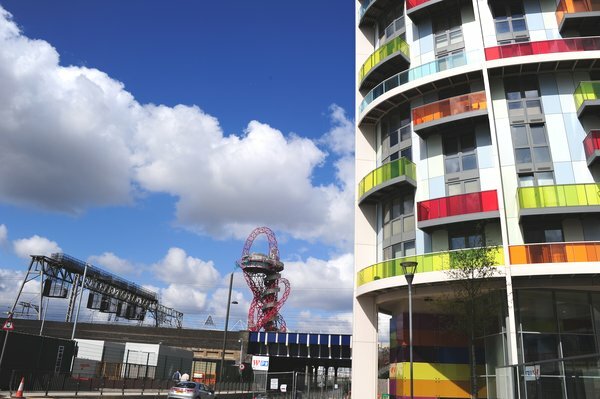 Boris Johnson, the mayor of London, has said that the ArcelorMittal Orbit, a spiraling goliath of red tangled steel that stands 35 stories above the city’s Olympic Park, would have “dwarfed” the aspirations of Gustave Eiffel and “boggled the minds” of the ancient Romans. Many Londoners don’t see it quite that way. They’ve called the Orbit, designed by the Indian-born sculptor Anish Kapoor and the Sri Lankan architect Cecil Balmond, the “Eye-full Tower” and “Helter-Skelter,” and have compared it to a “contorted mass of entrails.” Envisioned as a symbol of London looming over the site of this summer’s Olympic Games, the Orbit, which visitors will enter, ascend and explore, is designed as an attraction to rival the London Eye and Big Ben for decades to come. And, at least for now, the sculpture is also serving as a prime target for British Olympic crankiness. The Australian artist Andrew Rogers is due to travel to Namibia in south-west Africa in August to work alongside nomadic Himba tribespeople on a stone geoglyph or earth sculpture. The “earth drawing”, as Rogers calls it, will measure hundreds of metres across and will be photographed by satellite on completion. The Namibia project will be the next phase of Rogers’s seven-continent “Rhythms of Life” series. The series inspired Google to make a video tour of the globe in which Rogers’s geoglyphs can be seen in satellite imagery. Rogers says he will arrive in the Namibian capital, Windhoek, on 14 August and travel to a rural, riverside location where he will “sit down and talk to [the Himba people] about what they would like to see recreated on the ground”. “These structures will relate to [the Himba’s] history and heritage,” Rogers says. Three structures will be created in the Namibian desert from the local stones. 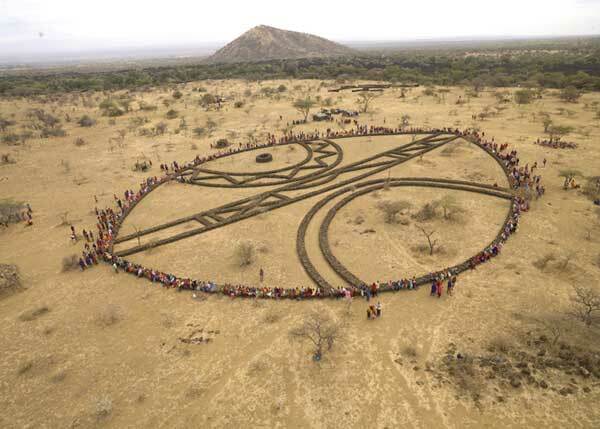 Rogers will offer to make one of his signature “Rhythms of Life” geoglyphs of which he has made versions on all seven continents, beginning in 1998. To see gargantuan steel sculptures fashioned by Richard Serra, you could visit the Guggenheim in Bilbao, Spain, or the Dia: Beacon, 60 miles north of New York City. Or you could go to a crane yard near a heating-oil terminal in Port Morris, an industrial corner of the South Bronx. There, amid belching smokestacks and clanging delivery trucks, sits artwork made by Mr. Serra, a secret grace note in a decidedly ungraceful block. The briny air from the river just steps away blows across the steel plates, bent in a trademark Serra arc that would be recognized on the moon — which, in the art world, Port Morris might as well be. 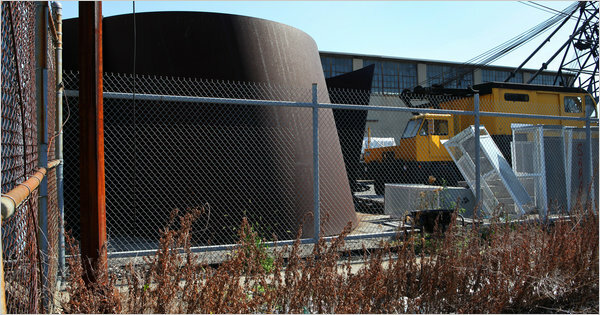 The piece — five plates, about one and a half stories high — is not displayed for public view or assembled as Mr. Serra intended. It stands behind a raggedy chain-link fence while a stray black-and-white cat stands watch. Cranes and falling-down sheds surround it. It has sat there for years, waiting to be delivered to its owner, said Joe Vilardi of Budco Enterprises, a Long Island rigging company that placed the steel in the Bronx lot and has long worked with Mr. Serra. “It is parts of a sculpture that are just in storage right now,” Mr. Vilardi said. As a blood red sun appeared to rise over the Round Pond in Kensington Gardens, while a huge silver moon set over the Long Water lake, it was clear the challenge for the round-the-clock security guards will be to keep swans, dogs and children off the art, not any vandals or robbers who might be interested to learn that several million pounds worth of contemporary art has landed in the heart of London. 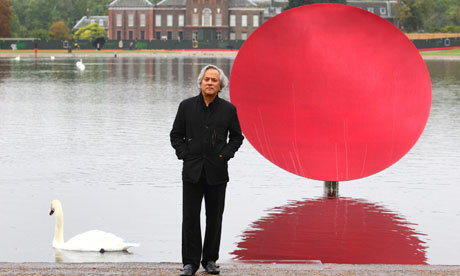 Anish Kapoor was almost as bewitched as the swans, even under the most Monday morningish of grey skies. While Kapoor’s giant pieces have been exhibited in the open air across the world and in many places in Britain, the last London saw of the Turner prize-winning sculptor was when he caused grievous bodily harm in the name of art to the Royal Academy, installing an engine forcing a giant block of crimson wax through narrow doorways, and a cannon which fired more blocks through another door until the room beyond looked like a particularly messy abattoir. Digital rendering of Doug and Mike Starn’s “Big Bambú,” a site-specific sculpture made of 3,200 interlocking bamboo poles lashed together with nylon rope. In the 12 years that the Metropolitan Museum of Art has presented exhibitions on its roof, visitors have seen sculptures by Jeff Koons, Ellsworth Kelly, Roy Lichtenstein and Roxy Paine. They have glimpsed more unusual projects too, like miniature black smoke shells that resembled inkblots bursting into the sky every afternoon, the work of the Chinese artist Cai Guo-Qiang. Now for the 13th installation, Gary Tinterow, the Met’s curator of 19th-century, Modern and contemporary art, has decided to try something more ambitious. From April 27 through Oct. 31 the twin artists Mike and Doug Starn will be creating a site-specific installation that is part sculpture, part architecture and part performance. Called “Big Bambú” it will be a monumental bamboo structure in the form of a cresting wave rising as high as 50 feet above the roof. Throughout the summer the artists and a team of rock climbers will lash together an intricate network of 3,200 interlocking bamboo poles with nylon rope, creating on the roof’s floor labyrinthlike spaces through which visitors can walk. You can make art to address any political subject, and the debate over climate change is certainly no exception, as a new futuristic installation by a Los Angeles architect proves. 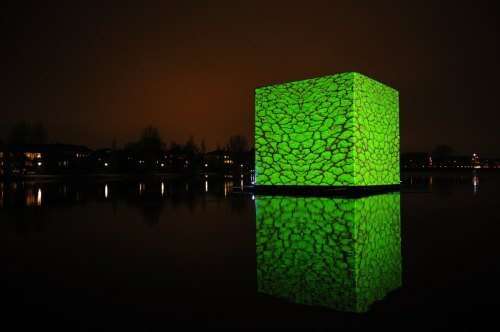 In Copenhagen, where the United Nations’ summit on global warming is currently underway, artists unveiled on Monday what they are calling “The CO2 Cube,” a three-story site-specific artwork that was designed by L.A.-based architect Christophe Cornubert. The structure, pictured, sits on St. Jørgens Lake, near the city’s Tycho Brahe Planetarium. Its creators said the cube represents the space that one metric ton of carbon dioxide would occupy if stored at standard atmospheric pressure — specifically, a space that is the equivalent of 27 feet cubed, or 19,683 cubic feet. The size of the installation is crucial: The average citizen of an industrialized country releases one metric ton of carbon dioxide per month, according to a report from the Intergovernmental Panel on Climate Change. “A lot of the conference is buttoned up and behind closed doors. So we wanted a way to reach out to the public,” said Mia Hanak, executive director of San Francisco-based Millennium ART, which is one of the organizations involved with the cube’s creation. 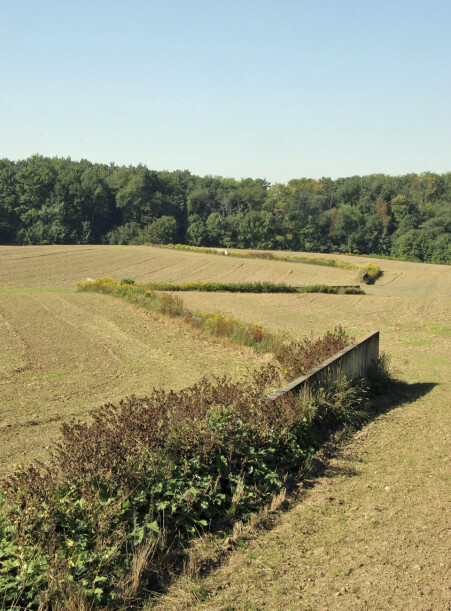 After considerable delay, an important and controversial vote is expected to be taken Monday by councillors in King Township, about 50 kilometres north of Toronto, on the fate of a meandering outdoor cement installation erected almost 40 years ago by internationally acclaimed American minimalist sculptor Richard Serra. On a gray, unusually muggy October day the artist and architect Maya Lin was showing a visitor around “Wave Field,” her new earthwork project at the Storm King Art Center here. The 11-acre installation, which will open to the public next spring, consists of seven rows of undulating hills cradled in a gently sloping valley. Ms. Lin clambered nimbly up and down them, regarding each nook, cranny and blade of grass with something of a proprietary air. Seen from afar the piece does suggest an expanse of ocean waves that have been frozen in place, as well as many other things: snowdrifts, a Zen moss garden, perhaps a cluster of the American Indian burial mounds that can be found in the hills of southeastern Ohio, where Ms. Lin grew up. In the past Ms. Lin has always conceived of her different career strands as separate. “I think it may be the only way I can keep myself balanced,” she said. 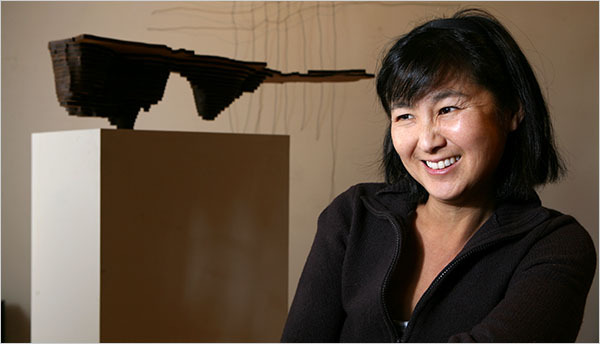 Although she is also working on a commission for the Museum of Chinese in America in Chinatown in Manhattan, she is reluctant to talk about such projects and her artwork in the same breath. “It kind of confuses people,” she said. Shortly before the American sculptor Isamu Noguchi was born in Los Angeles, in 1904, his father, a poet, abandoned his mother and returned to Japan (Noguchi later confessed a “moral loathing” for him). Two years later, his American mother, also a writer, decided to emigrate and raise her son in Tokyo. But when he turned 13 she sent him back, alone, to an American high school. He never forgave her. Noguchi died in 1988, and today his memory is kept alive by the museum that he founded on the site of his old studio in New York. But next week his spirit descends on the Yorkshire Sculpture Park, in what will be, remarkably, the first major show of his work in Europe. The venue is apt, for one associates Henry Moore’s figures with the park’s rolling landscape, and in many respects Noguchi is America’s Moore. His early style, exemplified in works such as Leda, from 1928, and 1000 Horsepower Heart (1939), was Constructivist and Futurist in inspiration. But later, like Moore, he would transform into a more versatile sculptor of abstract form. During the war his style would take on an anguished, Surrealist mood in works such as Figure, a piece he made in marble in 1944, and then cast in bronze. Later, he would become a sculptor of polished monoliths and strange ancient stones such as Woman, from 1984. Like Moore, Noguchi also loved public projects. Unlike Moore, however, he had no talent for practicalities, and most of his early proposals were quickly rejected. In 1933 his proposal for a vast playground in New York was snubbed. Then he proposed building a pyramidal mound a mile wide on the prairies and installing on it a giant steel sculpture of a plough. That also failed. In 1947 he came up with an idea for a Sculpture to be Seen from Mars: a vast face made from mounds of sand, with a nose a mile high, located “in some desert, some unwanted area”. Again nobody wanted it. Amid these disappointments, Noguchi struggled, and in his early years he supported himself as a sculptor of portrait busts to America’s creative elite. But his moment would come. Finally, in 1951, he was commissioned to create his first garden, for the offices of Reader’s Digest in Tokyo. He built a sculpture garden for the Israel Museum in Jerusalem. He even managed to persuade authorities in Atlanta to let him build a playground (though arguments over the safety of his equipment simmered on). He also built two bridges in a Peace Park in Hiroshima. As a schoolboy, the fashion designer Issey Miyake would cycle over them every day. Later, the two would become friends, and Noguchi would become an inspiration for Miyake, who saw in him a model of the successful Japanese creator – true to his roots, yet understood across the world. “I am living with a sense of having been passed a baton,” Miyake once said. Noguchi also created an eerie white marble garden for the library of Yale University. It contains some of his favourite motifs: a circular sun symbol, a pyramid to represent the earth, and a cube standing on one of its corners. The latter was a symbol, for Noguchi, of chance, and if you thought that only sage institutions such as Yale would favour such things, take a stroll down Broadway on your next visit to New York and you’ll find a massive red cube balancing in front of the black tombstone edifice of the Marine Midland Bank, looking as if it had fallen off the roof. Many of the public projects that Noguchi undertook after the war still survive, though many look dated. So it is perhaps odd that Noguchi continues to fascinate critics. Some see him as a predecessor of the land artists of the 1960s, figures such as Robert Smithson and Michael Heizer – creators of massive earth sculptures and enveloping environments. Others see an early example of today’s globe-trotting, culture-swapping artists. What strikes a bigger chord about Noguchi is the sheer heedlessness with which he crossed boundaries. One important inspiration for him was the dancer and choreographer Martha Graham, whom he met in the early 1930s, and for whom he created some 20 set designs. Another model was Buckminster Fuller: Noguchi met the Modernist visionary in the early 1930s, and Fuller would continue to be a great supporter, proving that even if the Modernist future looked very techno-scientific, it could also embrace ancient and mystical accents as well. But it was undoubtedly also Noguchi’s own Japanese heritage and his own spirited inclinations that led him to be such an artistic gadabout. He tried ceramics – and his sleek cups and saucers are still made by Vitra. He even tried furniture, and had his designs taken up by Knoll and Herman Miller. After being asked to contribute to a book called How to Make a Table, Noguchi took a form he had been working with, a loop of wood, cut it and swivelled it and crowned it with a glass top to create his 1944 coffee table (Herman Miller still produces it). And, after a trip to Japan in 1951, when he visited the town of Gifu, which was famous for its lantern makers, he designed a series of Akari lamp sculptures made from bamboo and mulberry bark. Today, their bootleg offspring adorn budget interiors the world over. Noguchi may have been uncertain at times, but by the end of his life he was reaching for a position where a sculpture could be a play object and a feat of product design as well. For his swansong at the Venice Biennale in 1986, he created a coiled Carrera marble sculpture, Slide Mantra, that at first glance looked like pristine and precious Modernism. If you had looked again you would have seen that it functioned as a slide, too.